Ion iProfile review | What Hi-Fi? The sight of your grandfather riding a BMX could hardly be more jarring than the appearance of the Ion iProfile. 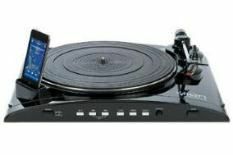 Record players and iPod docks – they're mutually exclusive technologies separated by decades, aren't they? Well, not any more. For £130, Ion will sell you a machine that can copy treasured/knackered/forgotten vinyl direct to your iPod without the need for a PC. It features a pre-amp so it can work with any amplifier, and the USB output means records can be copied to a PC hard-drive too. It's no looker, and the price tag reflects the rather flimsy build quality and graunchy switch action, but it comes with a tonearm and cartridge as well as RCA connections to your amp, and it's simplicity itself to set up. It's a shame, then, to report that, in action, the Ion is no great shakes. A play of Springsteen's Born to Run has hints of traditional vinyl strengths – robust, articulate low frequencies, coherent timing and ample detail – but the overall sound is flat, devoid of any dynamic variance and altogether too sibilant for our taste. The same is true of recordings. Music is recorded as voice memos and can be recategorised when the iPod is synced to a computer, but in any event there's a flat ho-humness to sound – even if the copied music is creditably detailed. In terms of usability, then, the iProfile is wholly fit for purpose: if there's a more straightforward way of transferring records to an iPod, we've yet to see it. Whether the resulting sound is something you'd enjoy is a different question.